PJ's Rebar stocks a variety of end prep products from some of the industry’s most trusted manufacturers. We offer end preps from Headed Reinforcement Corp. (HRC) and Erico LENTON (now part of Pentair). PJ’s Rebar is an approved and exclusive fabricator for both HRC terminators and couplers and Erico LENTON threaded couplers and terminators. We install HRC end preps in-house to provide solid, reliable connections for our preassembled rebar structures. We can also add these couplers and end terminators to cut lengths, bent forms, and other custom-fabricated rebar products for our customers. Male/female HRC couplers can be used to join rebar pieces into an “ultimate splice” that provides 125% yield strength—the rebar itself will fail before the couplers do. Round or square couplers are available. HRC model 555 headed rebar terminators are an effective alternative to standard hooks and right angles in pile anchorage, beam/column joints, and other applications. Erico’s LENTON threaded rebar splicing products are available in many sizes and shapes (round, square, rectangular) based on bar diameter and geometry. PJ's Rebar uses two in-house threading machines to add threads to the ends of rebar pieces, then tightens LENTON couplers or terminators in place to give our customers a time-saving solution for nearly any rebar splicing challenge. Male/female couplers and rebar terminators are available. Simply specify which LENTON splicer fits your needs and we will add the hardware to your rebar prior to shipping. No fabrication in the field is required! 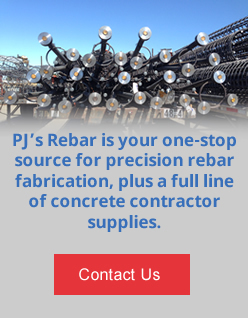 PJ's Rebar has the right rebar end preps for any application. Request a price quote today, or contact us for more information.